Former blogger turned web designer, Joelle Reeder has worked with several New York Times bestselling authors. Since she joined the Reedsy marketplace a year ago, she has already helped countless authors build their online presence with websites that stand out. 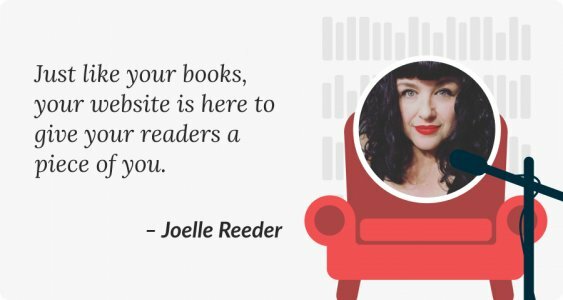 In this interview, Joelle tells us how she started her career and shares some tips on how to create the perfect author website. Hi, Joelle. Tell us a bit about who you are and what you do. Hi! My name is Joelle Reeder. I'm the owner of a web design and development studio based in San Diego. I'm a designer and developer, primarily for the WordPress platform. I also co-authored The IT Girl's Guide to Blogging with Moxie. How did you get into the business of making websites? Who were your first clients? I've been tinkering with the web since that little ‘under construction man’ gif was cool (remember him?). I'd started my own little website for my friends and myself back in the late 90s. In 2000-2001, I then started my own blog, Tenth-Muse.com, where I wrote daily in a conversational style and with a cheeky attitude that readers seemed to like. That was when blogs really started to pop up. I spent a lot of time designing it, experimenting with the design and generally having fun and learning how blogs work. Blogging was a much smaller pond then, so when people took notice of my work, they started to ask if I'd be interested in doing it for them. For me, it was a natural transition from blogging to broader web design. I met my friend Katherine, another talented designer, via her blog and together we hung a virtual shingle called "Blog Moxie" in February 2003. It kind of exploded, much to our surprise! So I quit my production artist job in Dallas, moved back to California, and started doing design full time. In 2004, we acquired our first author client, wonderful historical fiction writer Jennifer Chiaverini — who is still our client today! By 2006, Wiley & Sons had asked if we'd like to write a book for their new tech series. After that, my business partner moved on to another profession but business kept rolling forward fast! 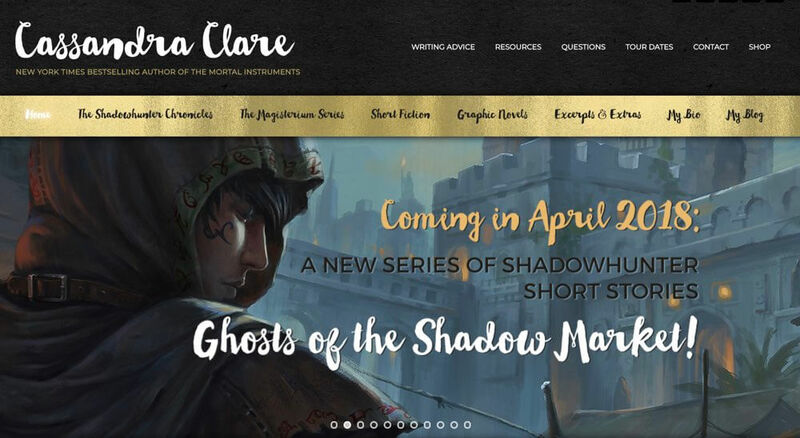 Our firm started working with more wonderful authors like Rita McGrath, Cassandra Clare, and Sarah Rees Brennan. And now it's 2018 and I'm still doing it! What type of clients do you usually work with today? I work primarily with authors and artisans. I've worked with a wide variety of authors, from leaders in business to authors of afro-futurist thrillers, from YA paranormal romance to fantasy and sci-fi, from aspiring to bestselling. I've also worked with boutique businesses for crafters and makers, such as local yarn shops (we've done lots of those!) to cheesemongers to sewing shops. I'm always open to working with most businesses or organizations, but authors and creators are my favorite! What motivates you most about the work you do? I really love seeing people follow their dreams and create something, whether it's a book or a business. That may sound kind of cheesy, but it makes me happy to help others manifest what they want — be that through their first book, their 10th book or their small business. I really enjoy bringing a client's personality to life online, conveying an author's unique sense of style or a shop's "interior experience" in an almost tangible way. I want readers to recognize their author's genre or feel like they are in their local yarn shop when visiting their website. 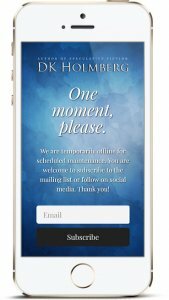 I’ve also learned that a website doesn't have to be visually dry to be adaptive on mobile devices, and I love showing my clients that we can do more with their brand. Tell us about an interesting project you worked on via Reedsy. I've really been lucky to work with so many great authors here on Reedsy. 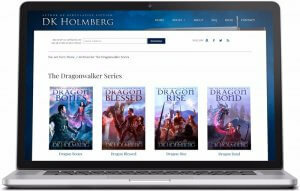 I've got a few projects in the mix right now, but a recent Reedsy client has been DK Holmberg, a prolific fantasy author, among other genres. He has been wonderful to work with and I had a lot of creative freedom to design something for him that reflected his style, but still allowed for growth in other genres. We ended up creating a custom interface for him to add books and organize them by "world" and "series" (in which a "world" could contain multiple series), and we made it really simple for him to add new books as he writes them. I also set up foundational search engine optimization and unique book page layouts to entice search engine indexing as well as reader book purchase. How do you typically approach a new project, from initial brief to deliverable results? When you contact me, I will usually respond with a greeting and ask a bit more about your project that may not be in your brief, especially your preferred budget and launch date — all before offering a quote. Each project is unique, so there is no set process from this point. Sometimes, clients are focusing on a book deadline and don’t have personal bandwidth for a lot of back and forth. In the case of DK’s, for example, he showed me his existing website, told me what colors and “vibe” he wanted, and then gave me creative carte blanche. Other times, especially when I create a website from scratch, there is a more step-by-step process. I create some mockups of each page that I review with the client before moving to the design and development phase. When a project is over, I usually include some time in the agreement for post-launch support — I'm not going to launch and disappear. Once the agreement is complete, I assure my client that they can contact me any time for future work, questions, or anything else they might need for their website or digital presence — I can always help. What tips would you give to authors looking to create a great website? 1. First, figure out what you can achieve with your budget and timeline. There are plenty of great solutions for websites within all budgets. Don't be afraid to tell your designer/developer your budget! We’re not here to max it out; we are here to help you get the most impact and value out of your website investment. Yes, some sites cost more than others, but I’m not going to pitch you a penthouse when your budget is more in the "2 bedroom fixer-upper" range. I want to help you succeed within your comfort zone. 2. 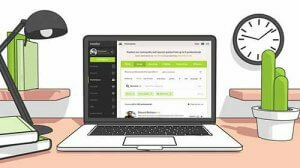 Inquire early with designers and developers. This is especially crucial if you’re on a deadline or have a small budget, as they can often help you define what you need (and weed out things that you don't), or point you in the right direction until you're ready for them. 3. Buy your domain name as soon as you want it — don't wait or it may be gone! Occasionally clients will tell me an amazing domain name and website idea, only to be disappointed when I tell them it’s already taken. If you have an idea for a good URL, first look it up to see if anyone else has it and if they don’t, buy it. 4. Finally, make sure your website is responsive (aka adaptive or mobile-ready). This means the design we create for your site needs to look great on your laptop and then adapt or respond to the device you’re viewing it on to change the look accordingly. This is not a separate “mobile site design”, this is one site design adapting to the device it’s being viewed on. Since mobile devices count for 57% or more of the internet’s traffic, earlier this year Google started indexing for mobile-responsive sites, potentially with a higher ranking. It’s imperative that your site be Google-friendly (and friendly for other search engines), as well as visually pleasing. That said, not only would your content adapt and display differently based on device, you could, if you were so inclined, have your site be purple on a desktop but change it to yellow on a smartphone. On tablets, maybe your site is blue. This is a basic example, but it can provide a lot of options creatively, as well as practically. From a human and end-user standpoint, my most successful websites are those where the author or owner engages with their readers. Make your copy welcoming, let your readers feel you're speaking right to them. Avoid overly gimmicky or lengthy copy. Whether you write regularly on your blog, import your tweets or Facebook posts, or even just share your Instagram photos... remember to give your readers a piece of you. They’re on your website to learn more about you, after all. And you are there to get them to buy your books... so strategic calls-to-action that don’t come off as spammy are essential, too. Essentially, you want your website to guide and engage your readers, just like you do with your books.